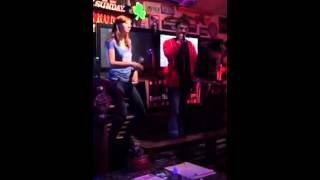 Daniel Radcliffe performed a near-perfect rendition of Eminem's 'The Real Slim Shady' at a karaoke bar in California. The 'Harry Potter' star was filmed rapping along to nearly every word of Marshall Mathers's verbose, fast-paced hip hop classic. His girlfriend Erin Darke was on hand to serve as his hype man, bellowing the chorus while dancing awkwardly beside him. It's not the first time the actor has covered a rap staple. Last year, he performed a similarly amazing rendition of Blackalicious’ 'Alphabet Aerobics' on Jimmy Fallon’s Tonight Show. “I’ve always had an obsession with memorising complicated and intricate fast songs,” he told Fallon at the time.